Our lives are littered with links. Since we can’t possibly read everything we see, we’re constantly putting things in their place, whether it’s sending longreads to our Instapaper queue or squirreling away interesting blogs in designated Safari folders. Stache 1.0.1 (Mac App Store link) wants to change all that. 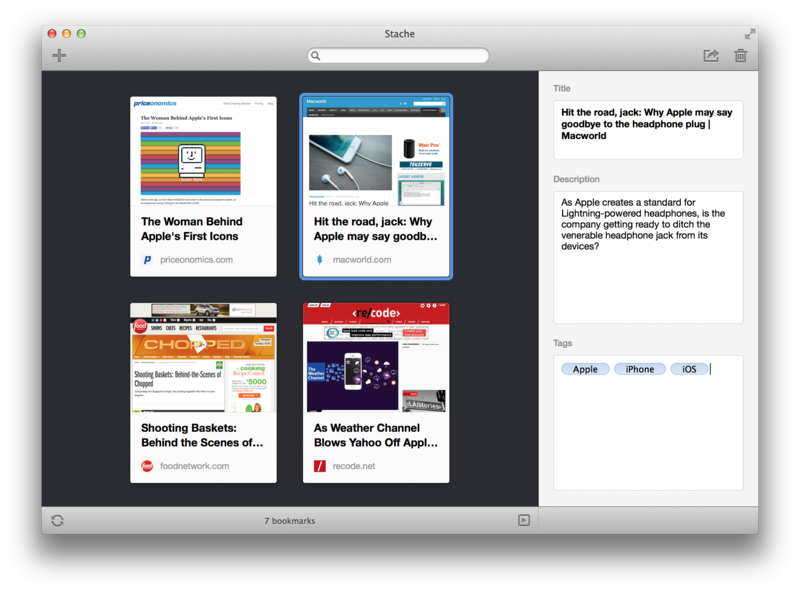 Bookmarking apps are hardly novel in this post-PC world, but Stache does it a little differently. Unlike the read-it-later services that focus on content and strip away the layout, Stache delivers a uniquely personal experience that doesn’t just store your links—it creates a corner of the Web with only the sites you care about. 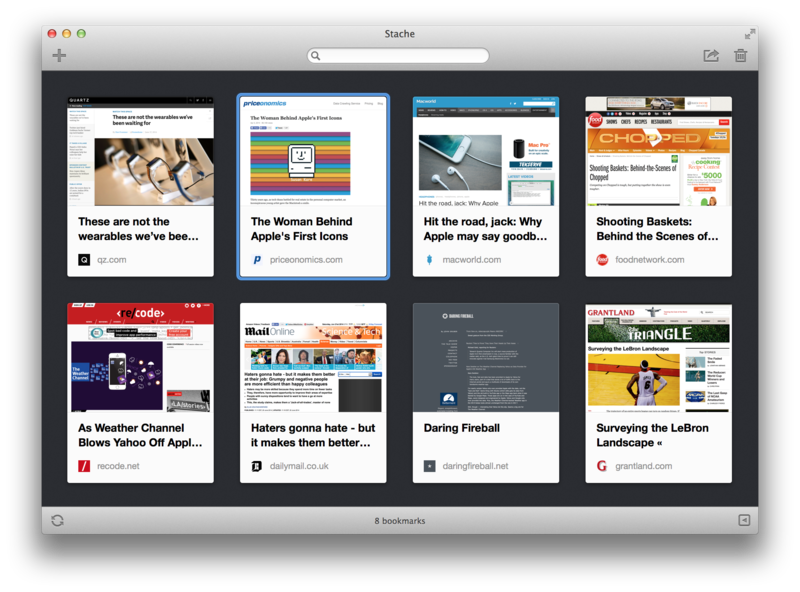 Right off the bat, Stache sets itself apart from other bookmarking services you may have used. For one, there’s no need to create an account (though you need to have iCloud enabled). Furthermore, you won’t find the usual list of collected links; there’s a definite Top Sites feel to the interface, with Stached homepages and articles all arranged as large previews in a neat grid. The visual layout lets you navigate a mountain of links in a flash, but it’s even faster to use the search bar, which quickly trawls every webpage in their entirety to find your query. And you’ll likely be using it often, since there’s no way to sort your sites any other way than chronologically. You can manually enter URLs to store them in Stache, but the preferred method is the handy one-click Safari and Chrome extensions. Clicking a saved link automatically opens it in your default browser, but the extra step seemed unnecessarily clunky; a built-in browser like the one in the iOS companion app would make a nice addition in a future update. Also useful would be a setting for distraction-free reading, and I’d love to see an API to expand the service beyond browsers. But even without these things, it’s easy to recommend Stache. Editor’s note: The following review is part of Macworld’s GemFest 2014. Every day (except weekends) from July until September, the Macworld staff will use the Mac Gems blog to briefly cover a standout free, low-cost, or great-value program. You can view a list of this year’s apps, updated daily, on our handy GemFest chart, and you can visit the Mac Gems homepage for past Mac Gems reviews.